Sold by Gemini under the part number IO828, this was a powerful graphics card at the time. 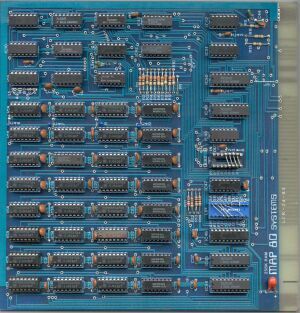 It had its own Intel 8088 cpu and memory, so was basically a computer in its own right – similar to a modern graphics card in fact! The piggy-back board is a IO830 Mini Palette board. In theory these could be changed depending on application, but I don’t think anything other than the standard board was available in any quantity. This allowed a choice of any 8 colours to be selected from a palette of 4096.